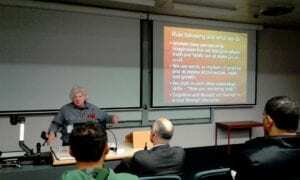 On the 12th of May people gathered in Dunedin for the Otago launch of New Zealand Christians in Science. Professor Grant Gillett presented a lecture on Aristotle and neuroscience. Below is the introduction by Dr Nicola Hoggard Creegan and, following, the lecture by Prof. Gillett. If you have already seen the introduction slides about NZCIS from the Auckland launch event video feel free to skip through to the lecture, beginning at 6:30.